Several commercial insurances, Medicaid, Healthy MI Plan, Medicare, CHIP and Some VA products are accepted – please call the office at 989-493-1947 to speak with our insurnce Specialist to verify if your product is accepted. As insurance plans may vary, it is your responsibility to know what coverage your insurance provides. care services subject to the deductible. The deductible may not apply to all services. would be $20. The health insurance or plan pays the rest of the allowed amount. you receive the service. The amount can varyby the type of covered health care service. premium, balance-billed charges or health care your health insurance or plan doesn’t cover. payments, out-of-network payments or other expenses toward this limit. 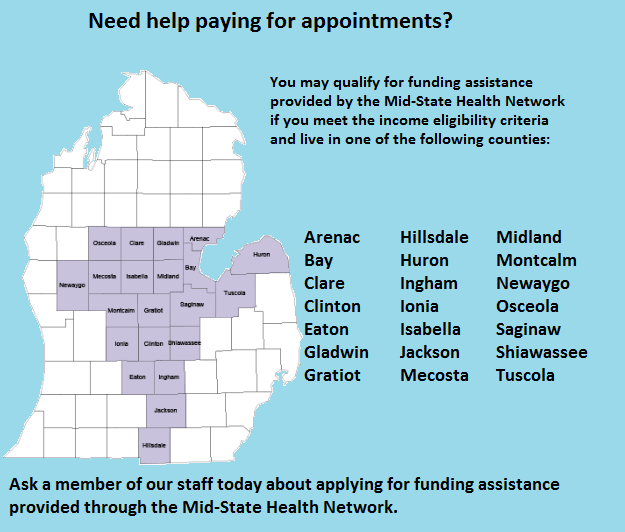 The Mid-State Health Network may provide funding assistance to help you pay for services*. This program is provided to individuals seeking substance use disorder treatment who do not have insurance or have a Medicaid/Healthy MI Plan product we do not accept, and meets the eligibility factors. Please contact the office to schedule a funding assessment to see if you qualify. In the absence of insurance coverage or funding assistance, fees for services* are based on a discounted sliding fee scale, which considers income and family size. This office serves all individuals regardless of inability to pay. Please speak to a member of our staff for specific cost information. If you are a veteran receiving VA benefits, please contact your local VA to initiate treatment. They will provide an assessment and then refer you to this office for treatment. Typically the cash rates for services* are $200 for the first appointment and $60 for all appointments after. Payments can be made by cash, check, or credit /debit card in the office, or over the phone by credit/debit card. Note: Returned checks are subject to a Non-sufficient Funds Fee. This will not be paid by your insurance. *Services include those provided in the office by office staff. External services such as lab fees and medication costs are not included. Insurances will often cover the costs of medications – please contact your insurance provider to learn about your prescription drug coverage. For individuals without insurance coverage, coupons or discount programs may be available to help make the costs of medications more affordable. Please speak to a staff member to see what type of assistance may be available. Lab fees are billed directly to your insurance company if you have insurance, or billed to you if you do not have insurance – this bill is separate from the appointment costs. Depending on your insurance coverage, you may receive a bill for a copay, deductible, or total amount of the bill. Contact Lab to For Payment options.